Turning 30 is a big deal! What better way to ring in the new decade than with a theme party. 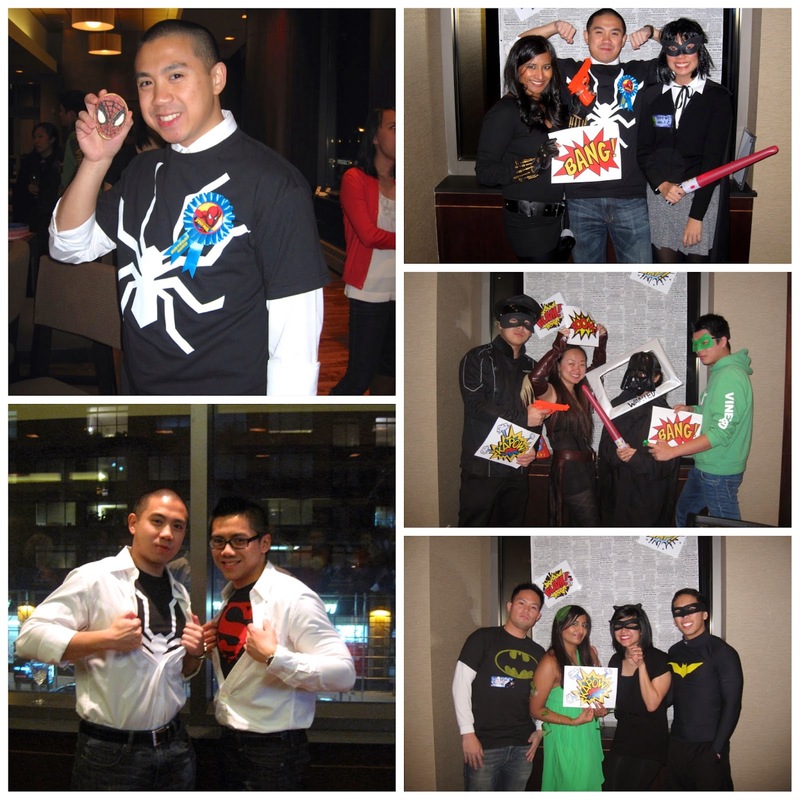 Our good friend, Tiffany, asked us to help plan her boyfriend (now husband), Karl, a surprise superhero themed 30th birthday celebration. This party took place in January, so it was fun to see adults dressed up as superheroes or villains months after Halloween. The birthday boy’s favorite superhero is Spiderman and he had a Spiderman T-Shirt waiting for him upon arrival. We created a whimsical menu, appropriate for both superheroes and villains. 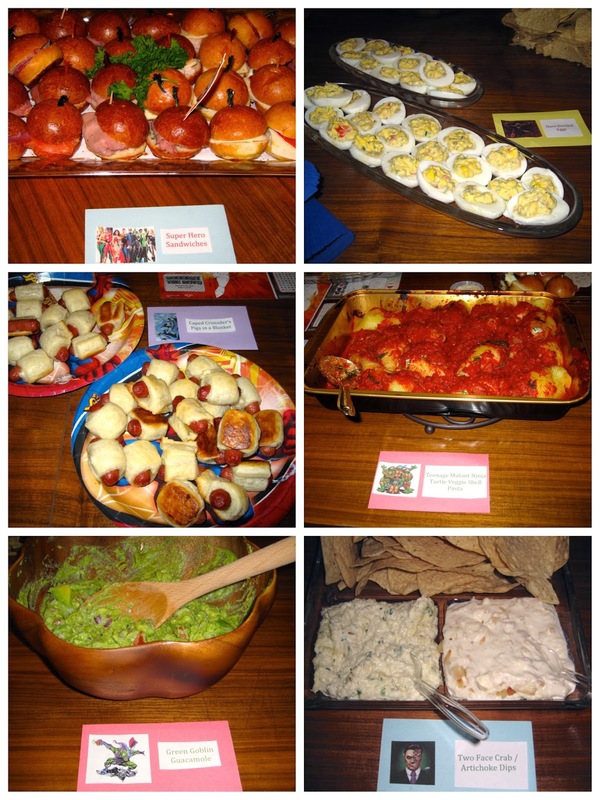 Guests dined on Superhero Sandwiches, Dare Deviled Eggs, Caped Crusader Pigs-in-a-Blanket, Teenage Mutant Ninja Turtle Shell Pasta, Green Goblin Guacamole and Two-Faced Crab and Artichoke Dip. For dessert, we found an adorable Superhero cupcake kit and cookie cutters from Williams Sonoma. We made vanilla and chocolate cupcakes that were decorated with Spiderman, Green Goblin, Thor, Hulk, Captain America and Iron Man cupcake liners and toppers. We displayed these treats on a Spiderman cupcake display that we found at Party City. 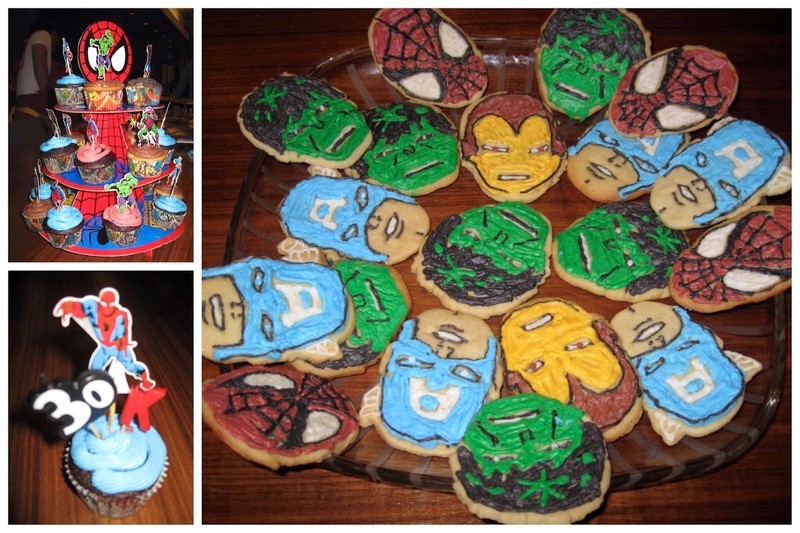 We also created sugar cookies with the faces of Spiderman, Captain America, Hulk and Iron Man. In order to create these amazing desserts, we needed to invest in a cake / cupcake decorating kit. We purchased a Wilton kit from Amazon, and with that Baked By Archana was born. Archana went from baking with box mix to baking from scratch. She now even bakes healthy, gluten free desserts. The birthday boy loved the cupcakes. Of course, no superhero party is complete without a fun Photo Booth. We found this newspaper fabric from the garment district. We printed fun signs, “BANG,” “BLAM,” “KAPAW,” and “ZAP,” that were reminiscent of the 1960s Batman TV series. We even created a “WANTED” sign for the villains. Eat, Drink and Get Stuffed! Next Post Calling All Wild Animals!